In November of 2013, a group of St. 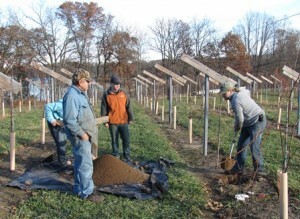 Cloud State University (SCSU) faculty and graduate students visited the property of Mervin Eisel near Ft. Ripley, MN. The trip was prompted by discoveries of stone artifacts Mr. Eisel made in his vineyard during the previous few years. Prior to contacting SCSU Mr. Eisel had taken his artifacts to Jim Cummings (Mille Lacs Kathio State Park) and Cummings suggested he bring them to St. Cloud State University for Dr. Mark Muñiz to examine. 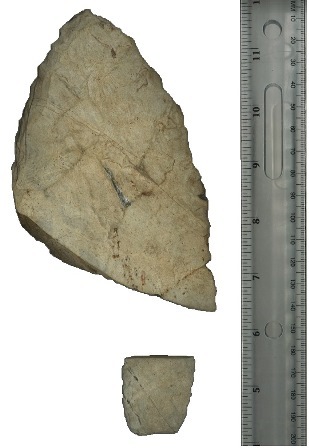 The artifacts are of special interest to Dr. Muñiz as they are made from Knife Lake siltstone (KLS) and include a large broken biface that is reminiscent of those recently analyzed from Knife Lake in the Superior National Forest and also a parallel-sided bifacial base that is similar in style to an Agate Basin point (but may be a knife). 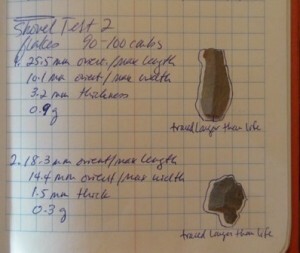 Mr. Eisel also found a number of pieces of KLS debitage and a KLS boulder weighing 60-70 pounds in the vineyard. The boulder caught Mr. Eisel’s attention because KLS does not naturally occur in the field where it was recovered and the small cobbles that are located there are generally fist-sized or smaller. Mr. Eisel was interested in knowing if the KLS artifacts he found were from a larger site in his vineyard and he invited the SCSU group out to investigate. The SCSU team conducted a close interval survey by walking each row of Mr. Eisel’s vineyard and adjacent berry patch and found two KLS flakes and a piece of fire-cracked rock. We then dug two shovel tests in 10-cm levels screening everything through ¼” mesh. The first shovel test encountered what appeared to be glacial till at 55 cm below surface (cmbs) and the test was terminated at 70 cmbs. The second shovel test encountered a layer of cobbles at 75-80 cmbs and possibly a buried soil horizon (Ab) between 85-95 cmbs (based on darker color and increased silt content). Between 95-100 cmbs the sediment in Shovel Test 2 became lighter in color and sandier while retaining some larger cobbles and by 105 cmbs the sand became coarser still. At 110 cmbs the sand continued to increase in grain size and the color changed to an orange that often indicates extremely ancient sediment in central Minnesota; the test was terminated at this point. The most exciting thing about Shovel Test 2 is that we recovered two KLS flakes between 90-100 cmbs, just above the contact with glacial till. If the estimate of a buried soil at 85-95 cmbs is accurate (although this remains to be verified with a test excavation), then the two flakes may be associated with it. The depth of the flakes below ground is also suggestive of great antiquity. Although the horizontal and vertical boundaries of the site have yet to be fully defined, the site has been named the Twin Lakes site. The Twin Lakes site is located near the crest of a south-facing hill overlooking the westernmost of the two Twin Lakes, after which it is named. The site is only 0.5 km from the Nokasippi River which drains into the Mississippi River about 5.5 km downstream. The Twin Lakes site is also located about 55 km northwest of the Bradbury Brook site, which is a huge KLS quarry and tool production site associated with the Late Paleoindian Cody complex. Mr. Eisel has extended an invitation to Dr. Muñiz and the SCSU archaeology graduate students to come back out to the site later in 2014 to continue the subsurface investigations by opening up several test units. The goals of this future research are to assess the artifact bearing level at 90-100 cmbs, determine the horizontal and vertical boundaries of any cultural deposits, and collect data on the depositional history of the site—specifically focusing on any buried soil horizons. If the test results indicate that dating the site is feasible, samples of either charcoal or sediment will be collected for AMS 14C or optically stimulated luminescence (OSL) dating. The SCSU team is very appreciative of Mr. Eisel’s hospitality and we encourage his continued interest in learning about the archaeological site on his land.